Forget munching carrots. If you really want to improve your vision, pick up a controller and have a bash at Grand Theft Auto. In a recent study Tel Aviv University, 22 game-playing teens were divided into two groups. One played violent video games like Call of Duty, and the other played The Sims 2. 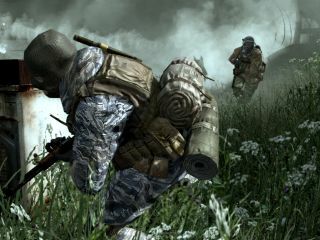 After playing 50 hours of the game over 9 weeks, the students who played the more violent action games showed an average 43 per cent improvement in their ability to discern between very close shades of gray or colour. The players assigned to the Sims game showed no improvement. Usually, such improvements are only found when opticians prescribe glasses, contact lenses or surgery. "We think that the games are taking the brain's visual cortex to the limits, forcing it to adapt to the added stimuli of the action games," says Dr Uri Polat of the University's Eye Institute. Among the test subjects, researchers measured an improvement of up to 58 per cent in contrast sensitivity. The effects were greatest for players who were very skilled at playing first-person shooter games. "As scientists and clinicians, we'd normally think about improving this aspect of vision by changing something in the optics of the eye, through surgery, for example. But we were able to show that action-oriented video games can improve the brain's ability to process visual information, effects which seem to last months after the game playing has stopped," says Dr Polat.